Villagers carry a patient on a makeshift stretcher in Doda. 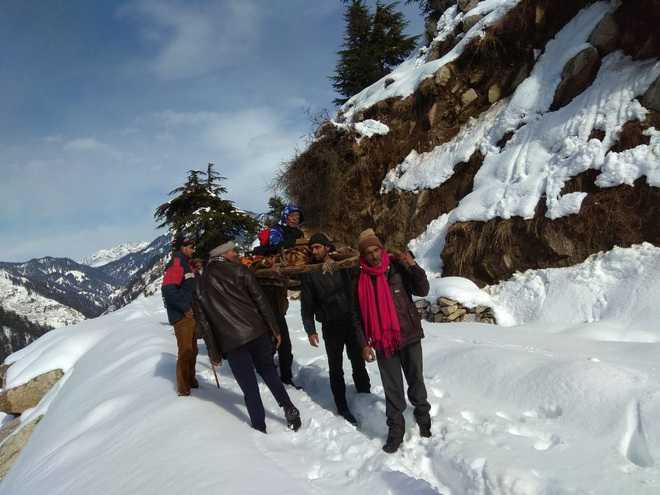 People living in the remote Dessa village of Doda district have been facing immense problems due to the recent snowfall, which has forced them to carry patients on makeshift stretchers to hospitals. Dessa is situated around 36 km from the district headquarters where most of the villages are yet to be connected with motorable roads. “The police and Army have extended a helping hand in road clearance and other emergency issues, but no help has so far reached from elected representatives or civil administration in these areas. Nearly 20 patients are waiting to be shifted to a hospital,” a villager said.